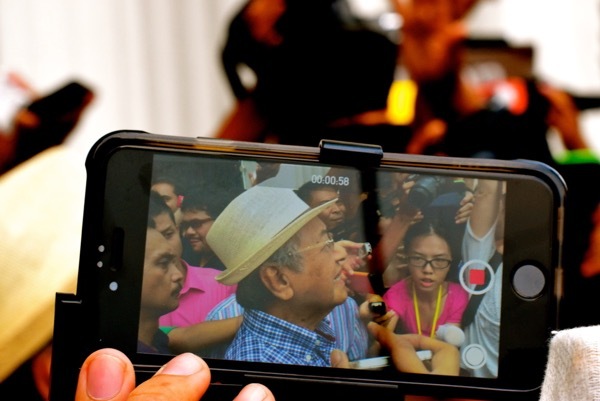 JAKARTA — When Mahathir Mohamad’s Alliance of Hope coalition surprised the world — and perhaps even themselves — by winning last May’s parliamentary vote in Malaysia, it was not just the first-ever opposition election win in the country’s history. Some saw it as the result of the first “WhatsApp election,” where the platform’s encrypted private messaging provided a sanctuary for citizens to discuss politics away from the raucous finger-pointing of social media platforms such as Twitter and Facebook. WhatsApp “offered security in that messages would come from ‘trusted’ contacts and thus be more ‘believable'” than open services such as Facebook or Twitter, said Serina Abdul Rahman, whose election research for the Singapore-based ISEAS-Yusok Ishak Institute took her to rural areas in the south and north of Malaysia. Apprehension over commenting publicly was likely heightened by Prime Minister Najib Razak’s anti-fake news law, which was announced ahead of the elections. Some saw the law as a tool for Najib to avoid public discussion of corruption allegations related to the scandal-riddled sovereign wealth fund, 1MDB. The perceived utility of private messaging for news dissemination seems to be growing following revelations that Facebook allowed user data to be shared with Cambridge Analytica, an elections consultant, last year. “WhatsApp use for news has almost tripled since 2014 and has overtaken Twitter in importance in many countries,” according to the Reuters Institute for the Study of Journalism. The irony is that a platform that arguably helped facilitate an unprecedented vindication of democratic elections in Malaysia last year has been used elsewhere to undermine democracy. In Indonesia, which holds elections in April, WhatsApp was used to organise demonstrations in Jakarta in December 2016 against the city governor, Basuki Tjahaja Purnama, a Christian of Chinese descent who was jailed a few months later on what many regarded as whipped-up charges of blasphemy against Islam. In January, WhatsApp introduced new rules limiting forwarding of messages to five contacts or groups, down from the previous 20 — itself a curb on last year’s original limit of 100 — a catch-all move meant to hinder the spread of potentially incendiary rumors and hoaxes ahead of elections in Indonesia, India and other Asian countries. Victoria Grand, WhatsApp’s vice president for policy and communications, said that unlike Facebook, messages on WhatsApp cannot be seen by the company itself because they are encrypted. This means that removing content deemed objectionable cannot be done without breaching the app’s much-touted privacy code. Grand met Indonesia’s Communications Minister Rudiantara to discuss how to stop hoaxes and sectarian insults spreading via WhatsApp ahead of the elections. In Indonesia, WhatsApp has thrived in an environment where legacy media, especially television, is seen as partisan. With outlets such as Metro TV firmly behind the administration of President Joko Widodo, WhatsApp appears to be growing as a means of reading, sharing and discussing news and politics, ahead of presidential and parliamentary elections taking place in under three months’ time. “It has already been a factor in the campaign,” said Titi Anggraini, director of the Association for Elections and Democracy, better-known by its Indonesian acronym Perludem. “Candidates are using it to spread information to voters,” she added. Facebook and Twitter, veterans since Indonesia’s 2014 elections, are also being widely used. WhatsApp’s new curbs tighten restrictions brought in last year in India, after roughly two dozen people were murdered as a result of rumors spread over the messaging platform. To Shivam Shankar Singh, a former campaigner for the ruling Bharatiya Janata Party and author of the forthcoming book “How to Win an Indian Election,” WhatsApp’s curbs did not do enough to curtail India’s vast and volatile rumor mill. “Most of the restrictions did nothing to curb fake news in India,” Singh said, as parties could come up with workarounds by buying multiple SIM cards.